Breakthrough—we all want it. We all pray for breakthrough. Maybe it’s breakthrough in our finances, in our relationships, in our jobs, in our health, in our addictive behaviors. We want it, but what does it take for breakthrough to happen? Scripture tells us there is a Breaker. There is Someone who can break through the obstacles and barriers in our way. He can tear them down, plow through them, overcome them. The Breaker is God Himself. God broke through for the children of Israel. Notice that He broke through for the “obedient” believers. Jeremy Risner, my pastor, usually has a lot of great quotes in his sermon and I love to capture them and share on my Facebook timeline. Today, he said this, “God will never bless us in our disobedience.” Wow and ouch! What we are praying for when we pray for breakthrough in any area of our lives is for God to bless us. We’re asking for a supernatural intervention in our lives. We want Jesus to ride in on that white horse and break through for us. Problem is we aren’t even being obedient to some of the small things He’s revealed to us and asked us to do. In my past that was always overeating. God calls this gluttony. The Catholic Church calls it one of seven deadly sins. There are some heavy things the Bible says about this sin. One is a story in the Bible about parents who have a stubborn and rebellious son who is a glutton and a drunkard. They take him to the elders of the city and ask,3 “What can be done about him?” Apparently there is no punishment that will suffice. I’m grateful I wasn’t born in Old Testament times. I probably would have been stoned years ago. It’s very easy for us to justify our own personal form of disobedience as no big deal or just this “one time’. It’s that old saying that alcoholics have, “One is not enough and 1,000 is too many.” When we get involved in doing something that we know is plain old disobedience doing it one time only leads to another and another. Then before we know it we’re crying out to God for breakthrough and wondering why He doesn’t appear like the Savior we know He is. “There is a supernatural reaction to the natural actions we take,” my pastor had the audacity to say. As I sat there taking notes that thought arrested me. He was talking about this in the positive sense that when we give to others, God gives to us in order for it to pass through us and out again to others. When we have been proven faithful to do this, then He will be faithful to us. It’s that breakthrough we always wanted, the financial windfall, because we have been proven trustworthy, obedient servants. It’s not for our glory, though. It’s for His glory and to share with others. The same thing happens with our obedience on our lifestyle change journey. 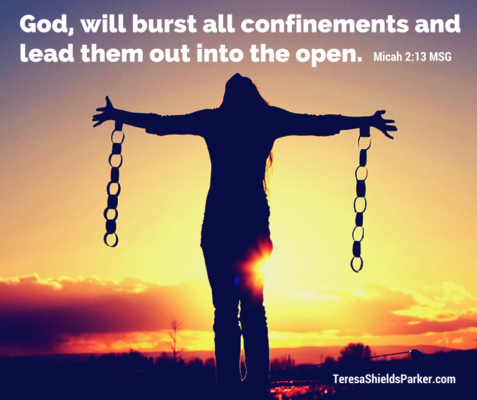 The supernatural reaction to our flagrant disobedience will be God patiently waiting until we take a big step of faith to surrender the foods that have become addictive to us. In the meantime we will flounder about amassing more and more and more weight. We can, however, make a change and do what He shows us to do. When He sees us taking action and being obedient, we fall right into His strong, capable arms of grace. His supernatural reaction to the natural steps of faith we take will be His power moving us forward. “My grace is enough. It’s all you need. My strength comes into its own in your weakness.”5 Is God strong all the time? Of course He is, but when we are not listening to Him, when we are trying to do everything ourselves, not admitting we need His help, He will exercise His divine patience and wait until we recognize our abject poverty and total weakness. Until we admit we really need Him, He’ll allow us to try to fix ourselves by ourselves. Taking a step of faith means finally surrendering completely to Him, following through with our actions, tapping into His voice to lead us on our transformation journey and doing what He shows us or tells us to do. Recently, it was prophesied over me that I have a breaker anointing. I didn’t know what that meant, so I’ve been studying it a bit. It is an anointing for breakthrough. I believe it is an anointing to help lead you to the Breaker and understand how breakthrough comes. I do that in my coaching groups. Right now is a great time for you to get involved. 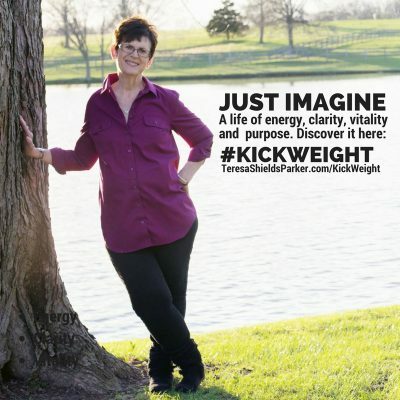 #KickWeight, my six-month coaching group, opens only twice a year, a few weeks before April and October. Right now I’m holding the group open for you until October 5. Work with me for six months, really dig into what this group has to offer and I promise your life will begin to change. Dare I say, you might just experience breakthrough? Yes, I do think so. Numbers keep coming in from my first #KickWeight group. To date 408 pounds have been lost. I’m excited for these amazing women who have experienced over-the-top results. One woman, Michelle Lee, lost over 90 pounds. Now, it’s your turn. This group will obviously take you through the holiday season teaching you how to say no to the things your crave and think you have to have. Join today. Doors close Oct. 5. Go HERE now! You make me smile! And I like smiling. Smiling is my favorite! Breakthrough will continue to happen in many different ways. Keep pressing in closer and closer to Him!